GLOBE Observer is part of the Global Learning and Observations to Benefit the Environment (GLOBE) Program, sponsored by NASA and supported by the National Science Foundation (NSF), NOAA and the Department of State. The GLOBE Program allows students to take part in Earth science by recording observations and analyzing them online with other students around the world. GLOBE Observer extends participation to citizen scientists; any member of the public can contribute data about their environment to this worldwide database. With a solar eclipse approaching in 2017, the team at GLOBE decided to start a campaign that would give people the opportunity to be involved with the eclipse. The team planned to create a single page in its mobile app that would enable users to take eclipse-specific measurements. As the eclipse approached, the number of new users steadily increased, adding about 50,000 new users to the system in total — far more than the team had anticipated. The team used the identity management features within Liferay to manage the new additions, which were tagged with a particular role so they could keep track of who was coming in through the eclipse project. 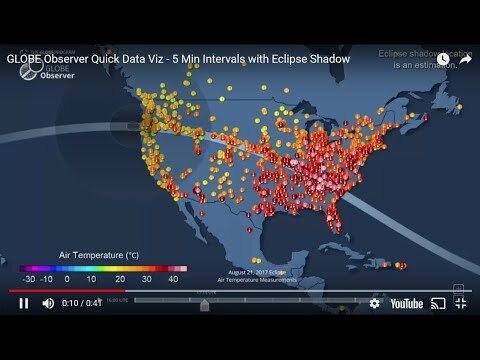 A week before the eclipse, the GLOBE team came up with the idea of displaying the aggregated observation data on a map that showed the path of the eclipse across the U.S. Users could move a time slider left to right and see the temperature data show up on the map as the eclipse progressed. SSAI’s development team was able to build the map and put it up within a week, and it instantly became popular. Several of the NASA centers had it displayed throughout the day and it was picked up on some of the news coverage of the eclipse. In the end, over 100,000 measurements were taken during the eclipse with the GLOBE Observer app, a massive spike relative to normal operations. With Liferay, GLOBE Observer was able to act quickly on an idea that contributed to its mission: Giving citizen scientists of all ages the opportunity to participate in the scientific process, and by doing so, contribute meaningfully to our understanding of the Earth system and global environment. “Once our developers understand the Liferay platform, they can modify it to do anything,” says Dave Overoye, Project Manager for the GLOBE website. “Literally anything.” This flexibility is a strong advantage as he works to balance the requirements of stakeholders from around the world. GLOBE is now working on opening up the eclipse project worldwide. A one-off, experimental project idea has become an exciting new way to engage people globally, and they were able to validate the idea with the support of Liferay.